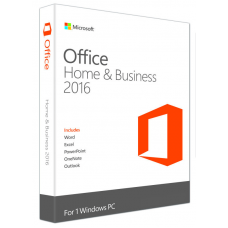 Office Home & Business 2016, 1 PC: The basics you need for your home or small business. From home projects to homework, Office helps your family make the most of every opportunity, every day. Communicate and share with family, friends, and colleagues. Access your files whenever you need them, using any computer with a web browser. • Full installed versions of Outlook, Word, Excel, PowerPoint, and OneNote. • For 1 PC, business or home use. • Easily save your documents online with free OneDrive online storage, available for all OneDrive users. What's new with Office 2016? • All the new Office 2016 applications: Office 2016 comes fully loaded with the latest and greatest versions of your favorite applications: Word, Excel, PowerPoint, OneNote, and Outlook. All the tools you know and love, only better. • Tools to boost productivity: You don't need to be a power-user to harness the power of Office 2016. The applications are packed with smart tools that make maximizing productivity a breeze. • Made for teamwork: Built-in collaboration tools enable you to co-author, share and edit documents with ease in Word, PowerPoint or OneNote. Work on the same doc simultaneously whether you're in the same room or across the globe. Organize email, coordinate schedules, and stay up to date with contacts. The new Outlook has push mail support so your inbox is always up-to-date. And improved Conversation View ensures that messages with similar subject lines don't get lumped in with conversations they don't belong to. You'll also find more options in how you incorporate and manage attachments. • Windows 7 Service Pack 1, Windows 8, Windows 8.1 , Windows 10. • Windows Server 2008 R2, Windows Server 2012, Windows Server 2012 R2 , Windows 10 Server. • .NET 3.5 required, some features may require .NET 4.0 or 4.5 CLR to *also* be installed. • Internet access (fees may apply). • A touch-enabled device is required to use any multi-touch functionality. But, all features and functionality are always available by using a keyboard, mouse, or other standard or accessible input device. Note that touch features are optimized for use with Windows 8, Windows 8.1 or Windows 10. • Product functionality and graphics may vary based on your system configuration. Some features may require additional or advanced hardware or server connectivity. 9V Batteries A single 9 volt Premium Alkaline..
Cougar Extreme Wireless Mouse Genis NX 7000 Comfortable 3 button wireless scroll mouse B.. Product DescriptionWKB208 Gaming Keyboard - The WKB208 Black keyboard has a standard design, the key..
Cougar Extreme Product Description Asus PRIME H310I-PLUS R2.0, Intel H310, 1151, Mini ITX, D..
Cougar Extreme Product Description Intel Core I9-9900K CPU, 1151, 3.6 GHz (5.0 Turbo), 8-Cor..